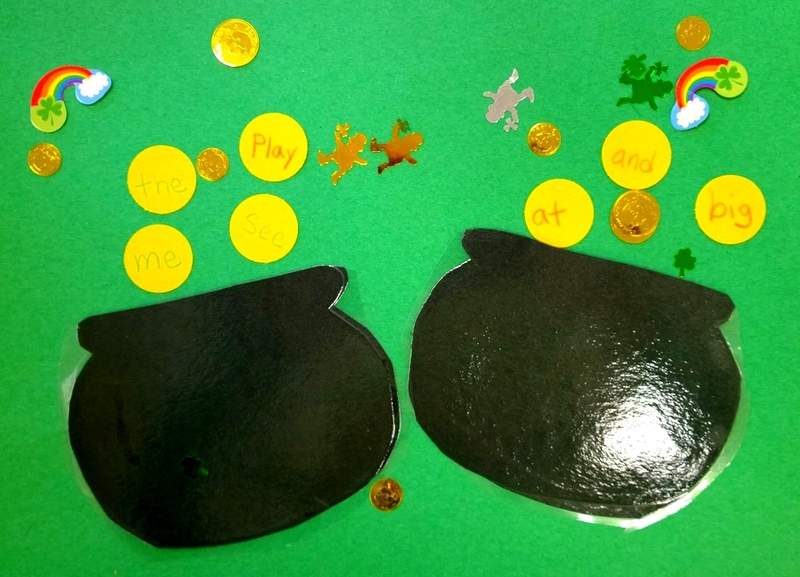 For a fun and festive Saint Patrick’s Day Activity, kids fill these little paper leprechaun pots with gold coins printed with sight words. We call this activity Leprechaun Sight Words because students write tiny words on the paper coins, as if they were wee little leprechaun. To prepare for this activity, first make the little black paper cauldrons or pots. You will need two cauldron shapes to make one leprechaun pot. 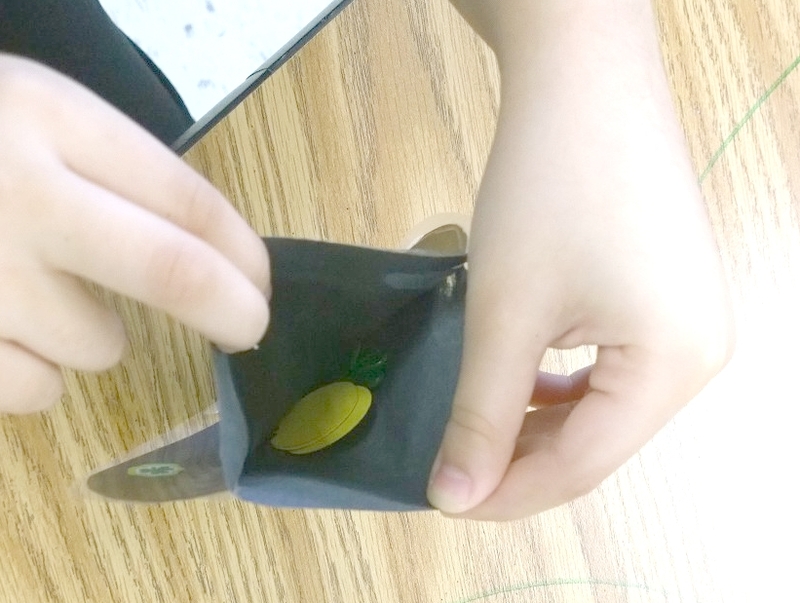 Fold a piece of black construction paper in half, and cut out a pot or cauldron shape. By folding the paper, you can cut out multiple leprechaun pots at the same time and they will all be the same size. Once you have the cauldron shapes cut out, take one and add a thin line of glue around the edge in a “C” shape, leaving the top part free of glue where the opening will be. Place another paper pot shape directly over the one with the glue on it. The top part should open and the bottom part should be sealed so it will hold the paper coins. You can laminate the black paper pots for extra durability and so they don’t tear when the kids are filling them. After laminating the paper pots, cut around them and across the top to re-open the pocket. Repeat until you have one paper pot for each child. 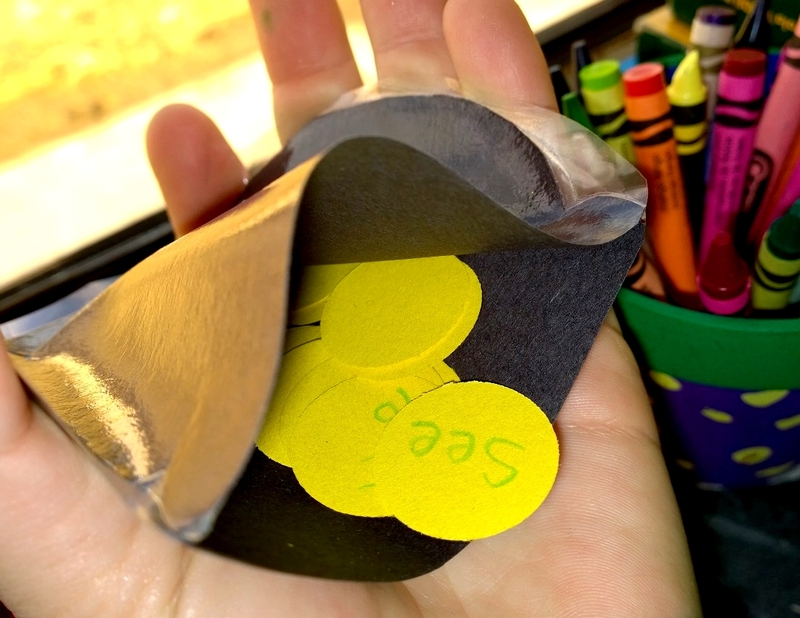 For the gold coin pieces, use a circular paper punch to punch out the yellow circles. You will want to make a lot of these yellow circles, at least 20-30 for each student. Put a handful of these paper coins into little cups to distribute to students at their tables. You can also mix in some Saint Patrick’s Day themed confetti. I think the confetti adds a little more fun and festivity to this activity and kids can put the confetti into their leprechaun pots too, as they fill them up with the leprechaun magic! 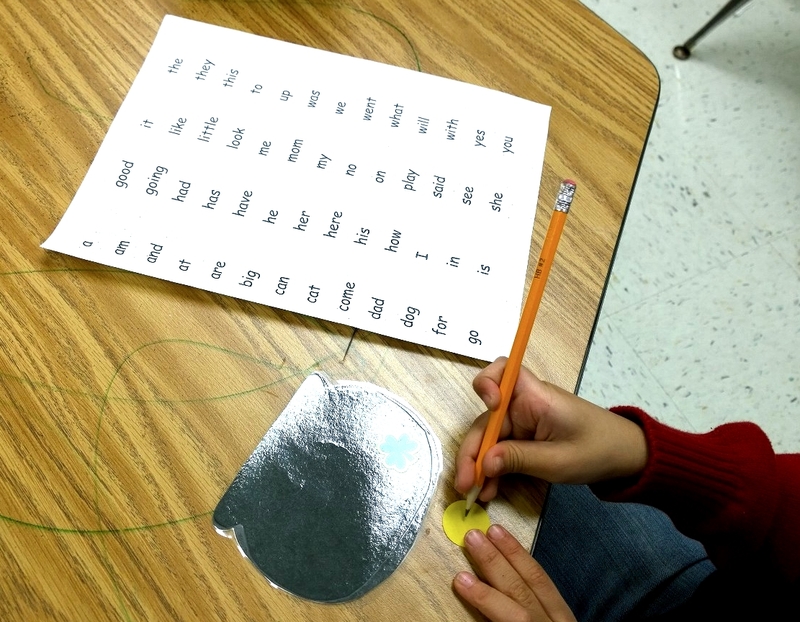 Print out lists of sight words to place on students’ tables. Students will copy sight words from these lists onto their coins. During the activity, pass out the cups with the coins and St. Patrick’s Day confetti. Give each child one black leprechaun pot and tell them that they will be filling their magical leprechaun pots with golden sight word coins. 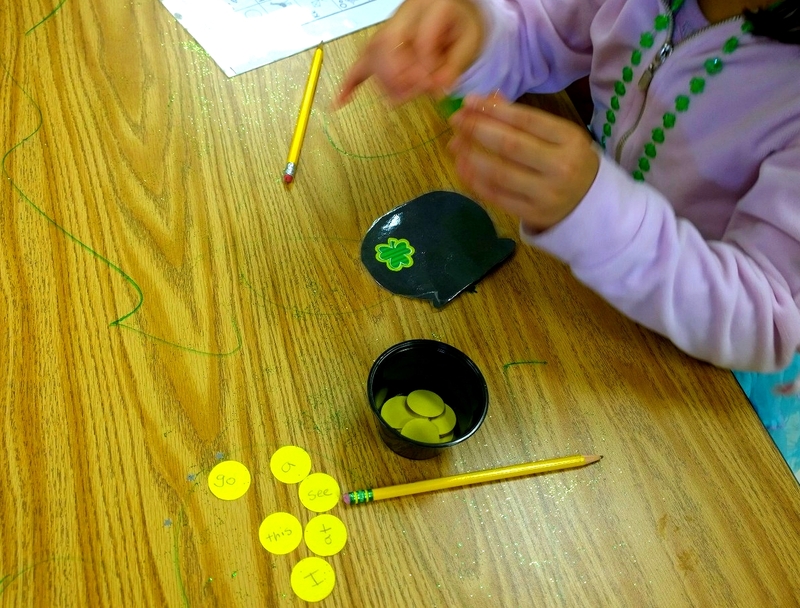 Students write a sight word on each yellow circle and put their collection of “gold coins” into their leprechaun pots. This activity gets kids to write small letters and words, which is something they seem to need a lot of practice doing. I’ve noticed that students in kindergarten often write using such big letters so I like how this activity gives them practice with writing smaller letters and words. 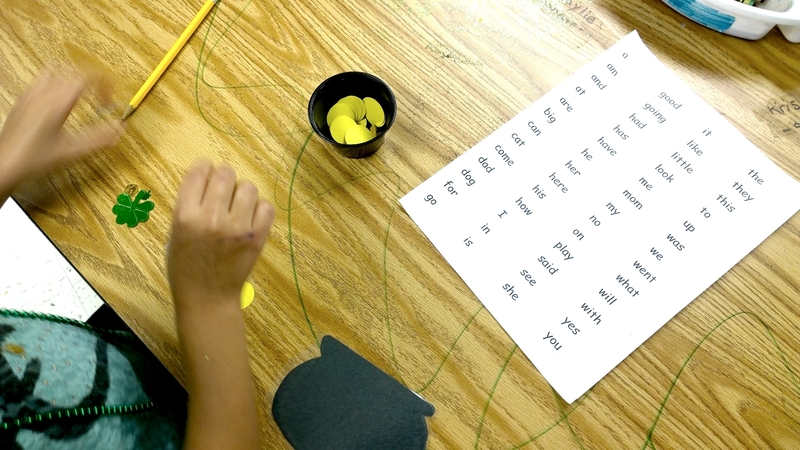 Kids practice writing words inside the tiny circles as they work to fill their magical leprechaun pots with as many leprechaun sight words coins as they can.